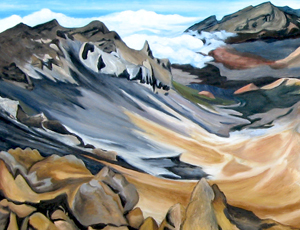 Ever since I stood on top of Haleakala volcano in Maui I knew that I wanted to paint it. It's summit rises 10,023 feet above the Pacific Ocean so as you look down into the crater you not only see a variety of beautiful colors from all the ash and melted rock but you can also see the ocean in the distance. At times it is difficult to see the difference between water, island and sky as you see all of the brilliant blues meshing. I'd say it is one of the most beautiful places in the world. Hopefully I did it justice.